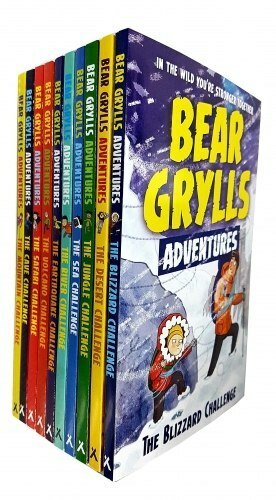 The tenth in the fun new 10-book collectible series for young readers from survival expert and Chief Scout BEAR GRYLLS. Bear Grylls Adventure Collection 10 Books Set Titles in the Set The Blizzard Challenge, The Desert challenge, The Jungle Challenge, The Sea Challenge, The River Challenge, The Earthquake Challenge, The Volcano Challenge, The Safari Challenge, The Cave Challenge, The Mountain Challenge. Olly isn't enjoying activity camp. Why should he bother building a shelter or foraging for food with his teammates - he'd rather be at home in the warm and dry, where the sofa and the video games are. Sophie loves activity camp . . . but is terrified of insects. It's so bad that she won't go into the tent on her own, just in case something flies at her, or she steps on a creepie- crawlie. But when she's given a compass by one of the other boys on the campsite, Sophie is magically transported to the desert on an adventure where they're impossible to avoid! Chloe is enjoying activity camp and all the outdoor fun - what's not to like? But she can't understand why everyone goes on and on about "leaving things the way you found them". After all, what's the big deal about a bit of litter in the middle of the woods? The world is big enough for a bit of rubbish not to matter. Charlie loves a challenge - he's addicted to video games and an expert at figuring our how to get to the next level. But sometimes the real world can seem a bit dull. Then he finds himself on the slopes of an active volcano, with red-hot lava heading his way! There's no time to be bored with Bear as his guide out of danger . . .
Evie likes new experiences - except for being extremely fussy about what she eats. Suddenly she finds herself on a sun-baked safari with Bear Grylls, where food and water are scarce and dangerous wild animals prowl the plains. To survive, Evie must eat what she can, when she can ... even if it seems absolutely disgusting. A mysterious compass with a fifth direction transports a young boy to an extensive cave system filled with bats, treacherous drops and hidden dangers. Luckily, survival expert Bear Grylls is on hand to guide him safely out, facing his fears and gaining in confidence along the way. A mysterious compass with a fifth direction transports a young girl to a mountain top high above sea level, where the air is thin, the steep drops are treacherous and the conditions tough. Luckily, survival expert Bear Grylls is on hand to guide her safely down the mountain, facing her fears and gaining in confidence along the way.